The Casing / Chamber is made out of Sheet Steel, duly spray galvanized internally (anti-corrosive treatment) and with synthetic enamel paint externally. All the internal components are identical to a Central Airwasher Plant. 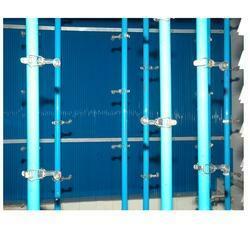 Louvers and Eliminators are made out of PVC, Filter of Nylon, Spray Pipes of GI / PVC and Nozzles of PP/PC. An Axial Fan directly coupled to a Motor is used and installed before the Airwasher chamber. 20/22/24 G GI Ducting distributes the air through PVC Diffusers or deflection type Grilles depending upon the location of the Ducting. A Pump is placed near the unit and connected to the Spray set. The unit could be placed over a Water tank of size 2'-0"(H) x 6' to 8' (W) x 16'-0" (L). Small units could also be hung from the roof if the roof is reinforced to take a load of approximately 1 Ton.